(Newser) – Aly Raisman, a three-time Olympic gold medalist in gymnastics, says she was the victim of some uncomfortable sexism at the hands of the TSA. The 22-year-old shared the story on her Twitter account Wednesday, the AP reports. 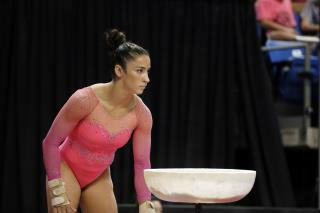 It started when a female TSA worker told Raisman she recognized her by her biceps. At that point, a male TSA agent started staring at her and told her he didn't "see any muscles." He was “staring at me shaking his head like it couldn’t be me because I didn’t look ‘strong enough’ to him," Sports Illustrated quotes Raisman as tweeting. Is bitching and PMS a sport????? No one cares honey. Get over yourself. What a stupid time to be alive. And if honey offends you, I simply do not care Aly. that was one guy so all the men in the world is presumed guilty she just lost a fan , when did bitchin become a sport ?